This week we are honored to feature an interview with Gordon Strong, the current Beer Judge Certification Program (BJCP) President, as well as the world’s only Grand Master Level V Beer Judge. 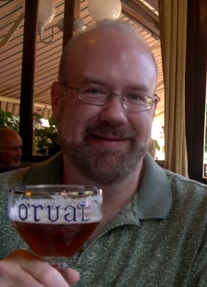 Gordon is also an accomplished home brewer, who won the 2009 Ninkasi award as the American Homebrewer’s Association Winningest Brewer. I would like to sincerely thank Gordon for taking time to do this interview. How did you get started in home brewing beer? Two old college friends of mine got me interested in craft beer and homebrewing in the early to mid 1990s. I tried their beer and liked it, and then naturally asked them what was involved. They loaned me some books, I bought a kit, and just started. My first efforts turned out very well, and I actually won BOS at the Ohio State Fair with my 5th batch of beer. That was all the encouragement I needed. You won the coveted Ninkasi award at the 2009 AHA competition for being the “winningest brewer” at the National Homebrew Competition. This was your second win (you won in 2008) – how did you do it? It was a great honor. I knew I had to “bring it” if I was going to defend my title on Jamil’s home turf. So I first set out to have as many different beers ready as possible. Then I carefully judged them as if I were one of the competition judges. I only sent my best efforts, and I tweaked some of the entries to make them fit the style better. I then repeated this process for the second round, including rebrewing some of the styles that I thought wouldn’t hold up as well (such as the hefeweizen). Finally, I just was lucky in getting judges that liked my beers. Competing is a real crap-shoot, and some days you just get lucky. I had one in three beers place in both the first and second rounds. You have been a freelance writer for several years on both Zymurgy and BYO – how did you get started in writing about homebrewing? It’s a natural extension of talking about beer. I just put the conversations I have with brewers and judges into writing. I think I started by trying to give presentations at conferences, such as the AHA NHC and MCAB. I also did a lot of writing for the BJCP when preparing the style guidelines. I also had been fairly active in online forums. Finally, I was technical editor for both Radical Brewing and Wild Brews, and contributed to Brew Like a Monk. It certainly helps for editors to see that you can meet deadlines and express yourself well. Then I guess I just had gotten enough name recognition and exposure through my work with the BJCP and the AHA Governing Committee that the work started rolling in. I recently signed a contract with Brewers Publications to develop an advanced all-grain brewing book, tentatively called Brew Better Beer. That’s my major project at the moment. You are the current BJCP President. Many brewers are familiar with the BJCP style guide, but tell us a little about the BJCP and beer judge certification. The BJCP is the principal certifying body for homebrew judges in North America, and is becoming known for the same in other countries (Australia, South Africa, Argentina). We administer beer and mead judge exams, sanction competitions, develop style guidelines and competition materials, develop training and education materials, and track judge progress through a ranking system. Judges must pass a three-hour written and tasting exam, which is very rigorous. The exam score, combined with experience points gained by judging in competitions, helps determine judge’s rank. The ranking system includes ranks for Apprentice, Recognized, Certified, National, Master and Grand Master judges. Higher ranks are earned through higher exam scores, more practical experience, and in the case of Grand Master ranks, service to the BJCP. You are a Grand Master BJCP certified judge – what does it take to get into beer judging? I’m currently the only Grand Master V judge. Each Grand Master rank involves doing everything you needed to do to get the first Grand Master rank again – getting 100 experience points, 50 of which must have come through judging (judges generally get one experience point per competition), grading 50 exams, and continuing to perform service for the BJCP (such as administering exams, grading exams, holding BJCP office, or teaching training courses). Anyone can be a beer judge. To be a member of the BJCP, one just has to take the BJCP exam. However, to do well as a judge, you need to study hard and do well on the exam. Then you need a lot of practical experience judging in competitions. How does one get to Grand Master level V? You have to score a 90 on the exam, which is something only 3% or so of examinees achieve. Then you have to get 500 experience points, 250 of which come through judging. Grading 250 exams and performing additional years of service towards the BJCP are also requirements. I’ve been a judge since 1997, so it took me about a dozen years to get there. It’s not something you can get through casual effort; you have to be deeply involved in judging for a long period of time. How does the BJCP scoring system work in competition? Beers are scored on a 50 point scale, with 12 points going for aroma, 3 for appearance, 20 for flavor, 5 for mouthfeel, and 10 for overall impression. A good beer will score over 30, while a great beer will be in the 40s. A perfect score is rare, indeed, since it’s almost impossible to hit a style perfectly, have no defects, and be perfectly fresh. Teams of judges individually assess a beer, coming up with their own scores and detailed comments on their perceptions. The judges discuss the beer and come up with a consensus score, which is used to determine the winner of an individual flight of beers. The category winners are then judged in a best-of-show round that will determine the overall champion of the competition. What do you look for when judging a great beer? First of all, it needs to be well-crafted and showing the brewer’s art. It must be properly fermented, not have any technical flaws, and be fresh. All beers are judged against style guidelines, which are a reference for individual beer styles. A great beer must capture the essence of the particular style, having great balance and flavor, and generally standing up against the best commercial examples. In summary, a great beer must hit the style well, be free of flaws, and be fresh. What would a first time competitor expect going into their first BJCP judged competition? It’s an eye-opening experience. An entrant should receive at least two scoresheets for every beer they entered, each with a detailed evaluation of the beer and a score. The evaluation should describe what the judges perceived, and how well they feel it fit the style. If they detected any flaws, they may offer feedback on possible courses of action to improve the beer. If you beer placed in the top three for your flight, expect a medal or ribbon. The competition standings should show who won medals, and who won best of show. Some competitions will show scores, so you might get an idea of where you placed relative to other entrants in your category. Judging can be quite variable, so entrants should submit their beers to multiple competitions to get a better sampling of opinion from judges. Remember that judging is subjective and not all judges will perceive the same things. So you’ll probably also be surprised to see differing opinions and assessments. Use them as data points, and compare them against your own impressions. Any advice for competitive homebrewers? Learn to be a beer judge. Understand what the judges are looking for, and then try to provide it. Understand competition mechanics. Then try to make the best beer you possibly can. When brewing for competition, pay careful attention to hitting the style. Not just the numbers, but the overall balance and impression. Taste your beer before sending it. Don’t send losers. Read the feedback carefully, and decide why your beer was scored the way it was. When rebrewing your beer, take the feedback into account and try to correct any mistakes. Try to give the judges what they want, and you’ll be ahead of the game. Does one have to iterate several times to create an award winning beer? No. Like I said, I won best of show with the fifth beer I ever made. You don’t have to iterate, but that means that you’ll have to start with good technique and a good recipe. If you plan your recipe wisely to fit the style guidelines and understand how to use ingredients and processes to get a certain outcome, then you should be able to make award-winning beers the first time. In many competitions, all you have to do is come up with a reasonably tasting beer that isn’t infected and superficially meets the style guidelines. In more competitive competitions, you’ll have to pay more careful attention to the style definitions and be sure your beer is fresh and tasty. Where do you see the BJCP going as an organization? We continue to expand at a growing rate. We had a record year in 2009 in terms of the number of people taking the exam and the number of competitions sanctioned. The hobby is becoming more popular, and more people want to be BJCP judges. I think it’s a good reflection on the organization to see demand this strong. I’m also very pleased that other countries are asking to form local chapters. Australia has been a very successful story for us; we’re approaching 100 judges there with over a dozen competitions a year. We’ve had inquiries from Japan, Germany and England as well. To see that people in other countries are recognizing the value of our brand and the legitimacy of our guidelines and methods is a strong endorsement. I see the BJCP continuing to grow both domestically and internationally, with more educational opportunities and resources being made available to our members. We continue to look for more programs to fund, such as providing sensory training kits to our members. We launched a mead judge program last year; we hope to do the same with cider in the future. Our goal is to have the BJCP recognized throughout the world as the premier beer judge organization, to have our style guidelines and classification system adopted uniformly, and to provide the best training and education materials for anyone interested in evaluating beer. I would like to encourage your readers to train to become BJCP judges and to join the American Homebrewers Association. Those two organizations do help you become a better brewer and judge. Come to the AHA National Homebrew Conference – it’s the best beer event of the year. I’ll also add a plug for The Brewing Network, which I feel is one of the best sources of online information on all things brewing. Get involved, have fun, and if you see me at a beer event, feel free to come up and introduce yourself. You get much more out of the hobby if you are actively involved. Most brewers and judges are great people who like to have a good time and talk with people with a passion for this hobby. You learn so much more through the relationships you build, so be sure to get involved and meet new people. => Thank you (and Gordon!) for joining us on the BeerSmith Home Brewing Blog. If you enjoyed this week’s article don’t hesitate to subscribe for regular email delivery, retweet or bookmark us somewhere. Have a great brewing week! How about %ABV of this beer? I am a fellow brewer currently reading your book ” brewing better Beer”. I have a question about a comment you made in the “Doughing-In” section and that i have heard others repeat. When doughing-in, the idea of aerating the mash causing oxidation is odd to me. We are stirring the gris to get a uniform exposure to h2o for hydration and temperature purposes which causes a certain amout of oxygenation. How, at this stage can there be an oxygenation negative component and why? It seems like it wouldn’t matter being the wort will be boiled shortly after which ultimately reduces the total oxygen content of the wort. Thanks for your insight and commitment to the art.